The area around Moraira abounds with places of interest as an alternative to the hot sands of the beach or the cool water of a swimming pool. Just to give you some ideas we have provided a very brief selection. For further ideas the Moraira Tourist Office have information on the many other places of interest and entertainment in the area. If you don't find the idea of driving around the countryside in the heat appealing and prefer to let others do the hard work then there are some excellent organised excursions available with air-condition transport and a guide include. CALPE BUS is one of the companies that specialise in excursions. Alternatively any of the Moraira travel agents can arrange daytime or evening excursions. However, if you do decide to explore the countryside, you could try some of the following suggestions. Benissa - (12 Klm inland from Moraira) A small, typically Spanish market town, it has a beautiful Cathedral and interesting squares and shops. Altea - (29 Kms south from Moraira) Another typically Spanish town on the coast, which has now been much settled by English/German and other N. European expatriates. It has a large street market and an excellent shopping centre. There is a long promenade lined with bars/restaurants but the beach is stony and shelves very steeply. The old town, now extensively renovate is quite fascinating. The streets are narrow and steep with overhanging balconies and there is big square with a domed Basilica. There are stunning views along the coast from Altea and a number of good restaurants. Altea also has a golf course and an interesting marina just outside the town to the north. 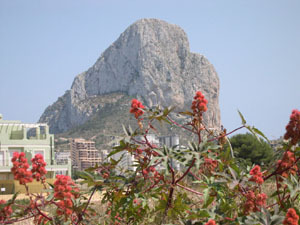 Calpe - (12 Klm south from Moraira) Boasts the Peñon de Ifach, which sits out on the coastline like a mini-Gibraltar. It has long beaches of soft, clean sand (Levante Beach especially, which is on the north side of the Peñon). The is an interesting fishing harbour and fish market with a number of Restaurants close by which obviously specialize in sea food including the Badal Restaurant. There are large shopping areas with an extensive range of shops, stores, bars and restaurants. Denia - (24 Kms north from Moraira) was once a thriving commercial port and now hosts a yacht-marina. Denia is now the Marina Alta county town with important law courts, customs offices and the commissioner of police. There are lots of good shops, an old castle dominating the town from a hilltop and some good sandy beaches. You can take a ferry trip from here to Ibiza either for the day, or for a few days break. The train station is right in the middle of the town, just yards from the main shopping street. Javea (Xabia) - (12 Kms north from Moraira) is a resort popular with English tourists and residents and comprises an old town centre with newer developments on the coast. There is a fishing port with a market in the evening and a good sandy beach. Gata de Gorgos - (13 Kms inland and north from Moraira) An old Spanish town on the RN332 Alicante/Valencia. Gata is famous for basket- and cane-ware. Guadalest - (32 Kms inland from Moraira) An ancient fortified town built up a steep mountainside which is now entirely tourist with many shops along the steep, winding streets selling souvenirs, leather goods, local weave material, glassware etc. There is a steep winding path up the rocky pinnacle which dominates the town, with stations of the cross on the way and a little open chapel at the top. If you take the route through CALLOSA D'EN SARRIA, you will pass through some splendid mountain country. Guadalest also has a large lake which is actually a reservoir. You can drive right around it by taking the turning just before the town (-marked "Embalse de Guadalest"), crossing the dam and arriving at the town from the back end via a couple of other villages. Jalón Valley - (Starts 22 kms inland from Moraira) Famous for its groves of Citrus and Almond trees, includes the towns of Jalon, Alcalili, Parcent and Lliber. There are lots of restaurants that specialise in the local cuisine, such as paella, and the Jalon wine is quite famous. Benidorm - (40 kms south from Moraira) is Spain's "holiday city". It goes without saying that the Benidorm beaches are the best in Europe with imported sand that is hoover-ed every night. The street level is packed with bars, restaurants, cafeterias, discos, night clubs with skyscraper blocks of apartments above and hotels in between plus dancing-bars, floor shows, theme parks, slot-machine arcades etc. etc. - and the holiday fun continues day and night 24/7. Most holidaymakers who choose the Moraira area for their holiday would not even consider Benidorm as an alternative but it is impossible to avoid the fact that, as the sun goes down, the Benidorm really comes to life. There are few cities in Europe that can compete. Because of the large number of year-round visitors entertainers are attracted from around the world to the nightclubs and discos. Benidorm Palace provides a spectacular show with beautiful dancers and lavish costumes - good family entertainment! Close by at Villajoyosa there is a casino where roulette and blackjack are played all night long. (You will need your passport and a jacket for the men). In case you are worried about drinking and driving, there are evening coach trips which include entrance to the various establishments and you can chance the short journey from the coach stop or arrange a taxi back to your villa. Alicante - (70 Kms south from Moraira) The provincial capital and a seaport city with around 400,000 population. It has a long portside promenade (Paseo Maritimo), which is paved in terrazo of local marble and lined with palm-trees. Although a major city, Alicante has a good beach and the adjoining towns of San Juan and Campello also have excellent sandy beaches. There is good shopping in Alicante - with department stores open all day long (no siesta) - and a superb selection of fashion boutiques. The Santa Barbara Castle sits on a hill, dominating the city and a cliff railway runs up to it. Valencia - (100 Kms north from Moraira) is the capital city of the autonomous state and Spain's third City after Madrid and Barcelona with around 1,000,000 population. The city is set on a river estuary, which is normally dry and although it is a coastal town, the seafront is mostly dock areas. It was from Valencia that El Cid rode to turn back the Moslems and the old City centre contains many historical treasures of that period, as well as one of Spain's largest and oldest Cathedrals and a bullring ranked as one of the foremost in Spain. The city centre is large, as you would expect of a town the size of Birmingham, with many stores and speciality shops.